The last time the Eagles had this much talent was 2004, when players like Dustin Moomau, Justin Gore, and Randy Shepherd roamed the field. That squad went 12-1 before losing the 5A State Championship game to Salina South. The five years since that season have been a rollercoaster ride for the Olathe North program, but it appears that the Eagles have finally put it all together again and are once again the team to beat for the 6A title ... at least on paper. James Franklin can probably be penciled in for a 2,000+ yard rushing season after dominate junior and sophomore seasons. What's more, Lucas Vincent and Tre Walker will lead a nasty defense loaded with speed. Also keep an eye on the Eagles offensive line--Oliver Venegas and Zach Maggard are as good as any lineman in the conference. In addition to all of that, the Eagles should see a decent amount of contribution from junior-to-be Adonis Saunders (above), who won the 6A 100 Meter Dash crown this past year as a sophomore. For years, the knock on Bob Lisher and the Lawrence Free State football program was their inability to make in-game adjustments to win big games. That all changed last season when Free State went on a tear in the 6A state playoffs, beating a 7-2 SM Northwest, an 8-2 Olathe North, and then a 10-1 Blue Valley team to make the 6A title game. Camren Torneden is back at quarterback for Free State, and he should make significant improvements with one year at quarterback under his belt. Running back Kirk Ressiguie, and receiver Keene Niemack will add another dimension of speed and quickness to the offense to compliment Torneden. The Firebirds also have the coach's son, Michael Lisher, back for another season on the offensive line. The Vikings have become a consistent force under head coach Tim Callaghan, and 2009 should be no different. Returning at quarterback will be DJ Balazs, who will be the first three year starting quarterback for the Vikings since former Kansas quarterback Tyler Lawrence. Balazs has enough experience and leadership ability to make up for the absence the Vikings will be feeling early on without last year's All-State running back, Darron Harvey. Athletes Adam LeBlanc and Drew Humphreys will be two-way starters for the Vikings, and both players have the range and ability to be very effective for SM West. Watch for developing junior-to-be offensive lineman Connor Askren to be a household name by season's end. The Hawks were dealt a big blow when the class of 2009 graduated. All-Sunflower League performers Jake Woten, Rick Settle, JaVon Williams, and Derahn Williams graduated in addition to the rest of their dominate senior class. The program has some catching up to do, but given Olathe East's recent history, a top four finish in the Sunflower League should be expected--regardless of who the team lost. Expect the Hawks lone All-Sunflower League returnee, Aaron Williams, to lead a young team. Also, veteran head coach Jeff Meyers has proven to be one of the best of the last decade, and the 2009 season could be turn out to be his best coaching job yet. Despite finishing the 2008 season with a less-than-spectacular 4-6 record, the Lions look to be on track to have a much improved season in 2009. They return Second Team All-Sunflower League performers in senior lineman Jay Baker, and junior linebacker Darren Sorem--both players epitomize the ideals of smash mouth football, staples of the Lawrence High football program. Add in the ability of Tyrae Jenkins at running back, and it is reasonable to assume the Lions should be a solidly improved team, good enough for a top five finish in the Sunflower League. 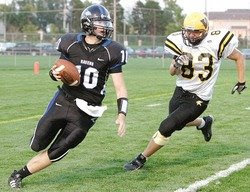 SM Northwest, in a similar mode to Olathe East, will be in line for many new starters on both sides of the ball in 2009. The good news is that the Cougars return Matt Nowak at quarterback, along with Chris Mansker at receiver, and Tim Hunt at the tight end position. 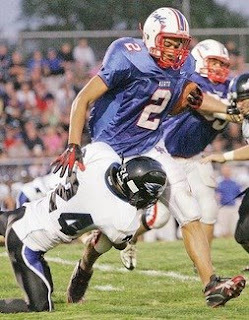 Also watch out for second team All-Sunflower League performer John Hauk to make his presence felt again in 2009, offensively at running back, and defensively at linebacker. The Falcons should show decent improvement in year number two of head coach Jeff Gourley. Olathe South has a history of producing top talent, and Gourley has a history of steady improvement with his teams (he was 47-40 at Belton H.S. in Belton, MO, but he won 36 of those games in his final five seasons at Belton). The combination of the two should be good enough to elevate Olathe South's win total beyond the 3-6 record they had in 2008. SM East is known for dominating the country club sports--tennis, golf, swim and dive, etc.--but football has never been a forte on the Prairie Village campus. Fomer head coach John Stonner helped the program to gain a respectable reputation in the KC Metro from 2003 through 2008, but the program never achieved a breakout season. The Lancers new head coach, Chip Sherman, has won three state championships in his career and has as good of a track record as any coach in the state of Kansas. His presence should be significant at SM East. Year six for head coach Todd Dain at Olathe Northwest should prove to be an interesting one. The Ravens return quarterback Josh Lemke (right) along with running backs Devon Boyce and Shawn Smith. The experience of that backfield alone should gain the program a few wins. The question remains whether or not the Ravens will be able gain any ground on the competition in a down year in the Sunflower League. The 2008 season was a step in the right direction for head coach Ryan Majors and the SM North football program. The three wins weren't awe-inspiring, but they were important to the state of Indian football. Two years starting quarterback Arthur Rucker will make the offensive switch to the slot receiver position, in addition to taking on strong safety duties. An increased focus on a spread offensive look could also play dividends for the Indians. SM South has been a down program for a long time, and there isn't anything that points to a dramatic turnaround in 2009--although big turnarounds have been known to happen in the Sunflower League. The Raiders lost one of their most dominant players in a long time in quarterback Dustin King to graduation, so addressing the quarterback position will be an immediate point of focus for SM South early on. Is 2009 the year the Pioneers finally rise from the cellar of the Sunflower League? It remains to be seen, but their head coach Chad Speer is young, full of energy, and is now in his third year as the head coach. The Pioneers also return a big time playmaker in Warren Brown, most notable for his appearance on Sportscenter's Top 10 Plays in October of 2008 after he returned a kick for a touchdown.